Save time at the bank with deposit slips that are personalized and preprinted with your account number, name and address. Check Advantage offers all the styles your business needs. 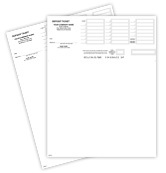 You can order Booked Deposit Slips, Laser Deposit Slips, or 3-On-A-Page Deposit Slips, which fit perfectly beside your 3-On-A-Page Manual Checks inside our 7-Ring Binder. 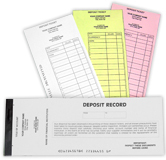 You can also get personal deposit slips when you order personal checks. Checks aren't the only thing you need to keep track of your financial transactions. Order your deposit slips today and never lose a step! Order deposit tickets online and they will be shipped within three business days. Expedited shipping options are also available for times when you need them sooner. Please refer to the frequently asked questions page for full details and answers to common questions.